New Necklace	 Isn't it pretty? read 16 comments | talk to me! I like it, what material is it made of? It's not fancy jewelry, just something that looked pretty in a clothing store. It's got bits that look like silver, and bits that look like pearls, and a wire holding it all together. Pretty! did you make it? No, I bought it (actually I basically got it for free because I had a coupon). But I'm very pleased with it! Fish Lab. Sounds really good, many good ideas (I want to know how Gabe's soup came out, and Chad's gumbo), but I just didn't get my act together. Chad's gumbo was really yummy! I didn't get to try Gabe's soup, because I only noticed it after I'd had a big bowl of gumbo. But I understand it also was very tasty. ...and I know, it's spelled SEMGS, but I tend to type it like I say it. On the plus side, I bought a t-shirt today, so now I'm a true SEMGSian! shirts are cool. Which shirt? ...and I've run into a couple of people who couldn't figure out where the name came from, since they'd never seen it written down. The desert one -- my favorite part of a meal! Very nice! Cute top, too. Thanks! I love the top, it was a present. Both are from the same store, one of my favorites: Petite Sophisticate. Sometimes it's easier to just post pics for a while. The stories will return soon, I'm certain. Nice necklace! What is up with that camera angle? Just a Treo pic, so I'm holding it in my hand. 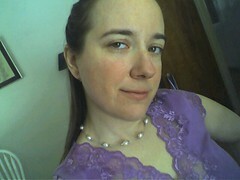 Tilting my head to properly show off the necklace, and that's how it ended up. Must be because of the very small lens. Do you have a book on Treo pic taking?